There have been stuntmen before Dave O’Brien and stuntmen after Dave O’Brien who have gone on to successful acting careers. Yakima Canutt and Jock Mahoney immediately come to mind. 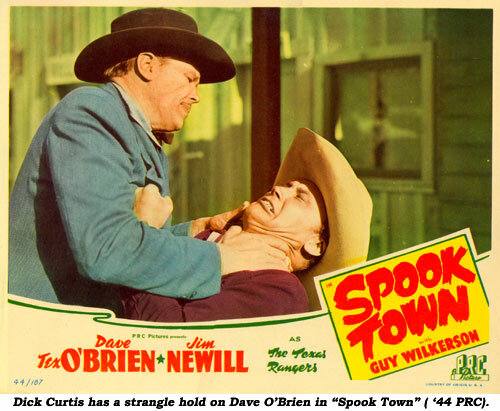 Dave started out among the ranks of extras, stuntmen and bit players, but through perseverance moved on to acting roles in low budget films, finally finding stardom in westerns. 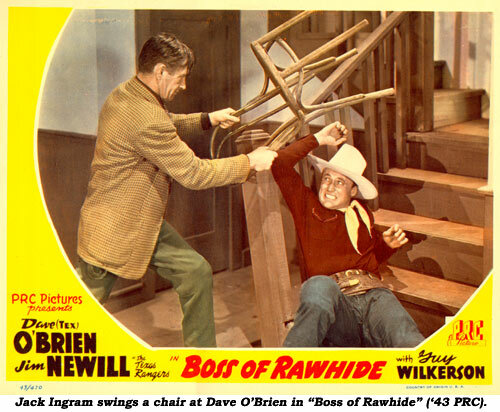 Dave O’Brien was born May 31, 1912, in Big Springs, TX, where his father was in the boiler works business. Almost from the start Dave knew he wanted to be an entertainer. He ran away from home at the tender age of 14, touring with the Harley Sadler Stock Company, singing, dancing, telling jokes and playing the ukulele. At 16, Dave made his way to L. A. and worked in local stage plays while making the rounds of casting offices. His first film work was as an extra in a 1929 Eddie Lambert short, with his first feature film in 1930, a bit part in First National’s “Dawn Patrol”. He found more work as a dancer, stuntman and bit player, finally landing a speaking part in Paramount’s ‘33 classic, “Jennie Gerhardt”. From this point on Dave stayed fairly busy in films doing stunts and pratfalls he’d learned on stage, supplementing his income as a singer and model for magazine ads. 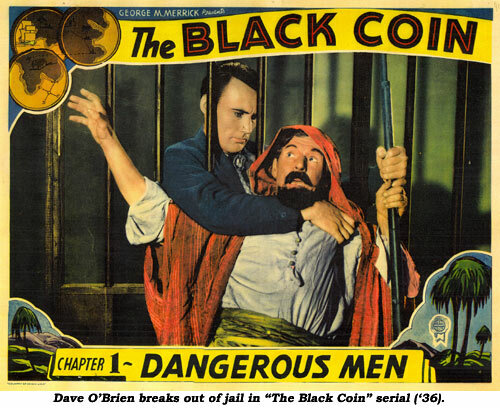 1936 was the turning point in Dave’s career as he was cast in his first starring role, Stage and Screen’s “The Black Coin” serial. 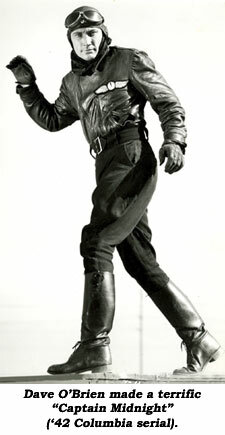 (He went on to appear in seven other serials, including the star role in Columbia’s stunt filled “Captain Midnight” ‘42.) The same year (‘36) he married Dorothy Short, a pretty young Philadelphia actress brought to Hollywood via an MGM contract. 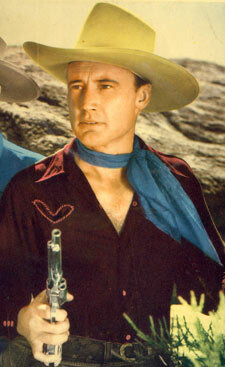 Over the next few years he was spotted in all manner of poverty row productions, especially westerns. Dave was on his way up the Hollywood ladder and, because of his good looks and physical ability doing his own stunts, he was pounding leather with such cowpokes as Tim McCoy, Buck Jones, Tom Tyler, Bob Steele, Tex Ritter and Jack Randall. 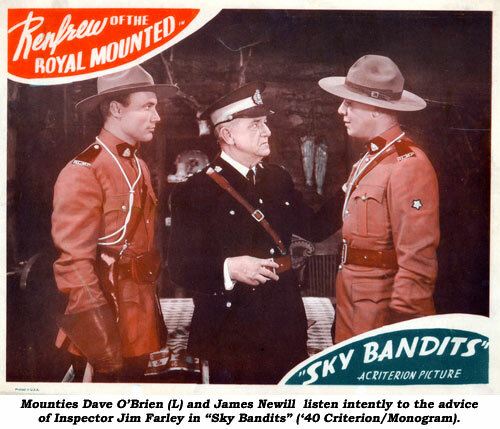 In 1937 he started work with Jim Newill in the Renfrew of the Mounted series, sometimes as a heavy, but often as Renfrew’s pal, Constable Kelly. He was a popular actor with producers and directors because he could do his own stunts. They could keep the camera on him instead of cutting away to a double. Alternating from balding heavy to toupeed juvenile, Dave continued to appear opposite John Wayne, Ken Maynard and others—even singing cowgirl Dorothy Page and child stunt rider Buzzy Henry. He seemed to find a home at PRC in 1941 when Buster Crabbe assumed the mantle of Billy the Kid from Bob Steele (who left to become a Mesquiteer at Republic). Dave took over the young sidekick role of Jeff (formerly played by Carleton Young and Rex Lease) in four titles. In 1942, producers Arthur Alexander and Alfred Stern rejoined the two Renfrew stars (Newill and O’Brien) to form the Texas Rangers series, adding lanky sidekick Guy Wilkerson for comic relief. Most of the freewielding, tear up the saloon action was assigned to Dave. “The Rangers Take Over” was the first; 13 more followed over the next two years until Newill left, presumably to return to the stage. Tex Ritter was brought in and eight more were cranked out. Again, Dave carried most of the action while Tex was content to sing a couple of songs now and then. Meanwhile, over at MGM in 1942, Will Jason, a director for comedy short subject king Pete Smith, recommended Dave to star in one of the series’ domestic comedies. Dave quickly became a pratfall fixture in the Pete Smith 10 min. specialties, and before long was also writing and directing, under the pseudonym of David Barclay. When the Texas Rangers series ended in 1945, Dave signed a long term contract with Pete Smith. The comedies now relied more and more on Dave’s stunt prowess. In story conferences, Dave would always demonstrate his spectacular falls, which often shook the building. In the final short for the series, “Fall Guy” (‘55), Pete calls Dave “the number one fall guy of the movies.” The short is jammed with stunt clips from previous shorts. Dave credited his work with Pete as “very educational, comedy-wise,” so when Smith retired in ‘55 due to heart trouble, Dave turned his attention to the new medium of television, starting a new phase of his career as an in-house stuntman, writer, actor and double on “The Red Skelton Comedy Show,” winning an Emmy in ‘61 for outstanding writing in comedy. 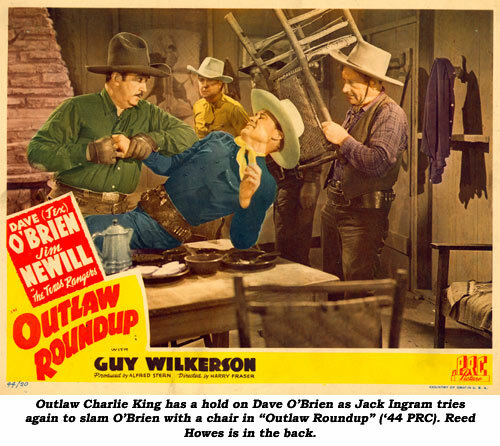 During this time, Dave appeared in only a few features, but one stands out—his last—“Desperadoes Are In Town” (‘56) in which he does a fine job as a vicious heavy. Sailing had long been a passion for Dave, and on board his beloved 60 ft. cutter, The White Cloud, he suddenly succumbed to a heart attack November 8, 1969, near Catalina Island. Dave O’Brien was reportedly a kind, generous man, always giving of his time and expertise to others and diligently answering fan mail, as I can attest to when he sent me an autographed photo after I wrote him care of the “Red Skelton Show”. Dave was survived by his second wife, Nancy Lee Lister, and five children. O’Brien, a hard working member of the Hollywood Posse, once asked about his career in Hollywood, stated he’d done most of what he’d set out to do, and was content the way it turned out. So are we Dave. Ya done good!